The river runs through high density residential areas, including Soweto, Lenasia and Fleurhof in the south of Johannesburg. Some residents supplement their diet by fishing the popular catfish in the rivers as well as dams fed by them. The Conversation Africa's Nontobeko Mtshali asked Rialet Pieters to explain the implications of these findings. What are these banned pesticides? The pesticides we looked at are collectively known as organochlorine pesticides. They are used in agriculture to control insects that eat crops. We did a human health risk assessment on the sharptooth catfish found in Orlando Dam and the Fleurhof and Lenasia areas in the south of Johannesburg. We chose this fish because it's popular and widely consumed. The pesticides we targeted in the sharptooth catfish were lindane, heptachlor, aldrin, dieldrin, endrin and dichloro-diphenyl-trichloro-ethane (DDT). We found levels of heptachlor, DDT, and lindane in the fish. All of the pesticides except for one, DDT, which is used against malaria-carrying mosquitoes, are banned in South Africa. So they should not be in the river. It's not clear how they ended up in the Soweto, Fleurhof and Lenasia areas, though they could have made their way down the river from malaria-prone rural areas of the country. The pesticides, with the exception of DDT, were banned by the international community under the Stockholm Convention on Persistent Organic Pollutants because of their harmful effects on the health of humans and wildlife. South Africa is a signatory to the convention and is obliged to reduce and eliminate the use of all the compounds listed in the convention. The DDT presence is unusual in an urban area because it's mostly used in more rural settings to control mosquitoes and the spread of malaria. 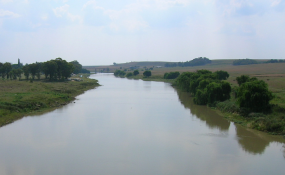 How bad are the pollution levels in the river that runs through Soweto, Fleurhof and Lenasia? We found the pesticides were present in fish tissue that we tested. DDT was the most prevalent at all the sites. The concentrations of the pesticides were at levels much higher than internationally accepted parameters. This suggests the fish pose a risk to human health because the compounds bio-accumulate in the fish and when people eat them they can potentially cause cancer. There is evidence that the banned pesticides, as well as DDT, can cause a host of cancers such as lung, skin, bladder, and non-Hodgkin's lymphoma, to name but a few. We did a human health risk assessment using the concentrations of the pollutants in the fish to predict their effects in humans when consumed regularly. We collected 30 sharptooth catfish (one of several species of fish in the river) and determined the concentrations of DDT in the fillet. We then calculated the chances of developing cancer for a human weighing 60 kg and eating 30 g of the contaminated fish every day. We followed the internationally standardised calculations and values for predicting human cancer risk. To account for the varying levels of pesticides in fish, cancer risk was calculated for the mid-range and high range pollutant level. The probable cancer risk to DDT exposure varied between the three sites. The probability of developing cancer from eating the fish contaminated by DDT from Lenasia was the highest. We found that 251 out of 10 000 people may develop cancer if exposed to the mid-range level of the pesticide and 1 105 out of 10 000 people may develop cancer from the high range. At Fleurhof the risk ranged from 172 to 359 in 10 000 and at Orlando Dam from 191 to 624 in 10 000 people. According to the US Environment Protection Agency, any risk greater than 1 in 10 000 is deemed an "unacceptable risk". We did not calculate the total cancer risk potentially posed by all the compounds together. Our focus was on DDT because of the high concentrations we found. People who regularly eat or buy fish from the contaminated water need to be made aware of the risks to their health. One way of doing so is to have notice boards that advise on the safe consumption levels of the different species. Fish from these areas need to be monitored regularly. And the sale of pesticides needs to be regulated better to ensure that the banned ones aren't being traded. Nico Wolmarans also contributed to this article. Mayumi Ishizuka works at Hokkaido University. She receives funding from JSPS (Japan Society for the Promotion of Science). Nico Smit receives funding from South Africa's National Research Foundation (NRF). Ruan Gerber received funding from the Nation Research Foundation (NRF). Victor Wepener receives funding from the National Research Foundation (NRF), the Department of Science and Technology and the Flemish Inter University Council. Wihan Pheiffer receives funding from Water Research Commission (K2/2242/1/16) of South Africa and the National Research Foundation. Yared Beyene and Yoshinori Ikeneka do not work for, consult, own shares in or receive funding from any company or organisation that would benefit from this article, and have disclosed no relevant affiliations beyond their academic appointment.